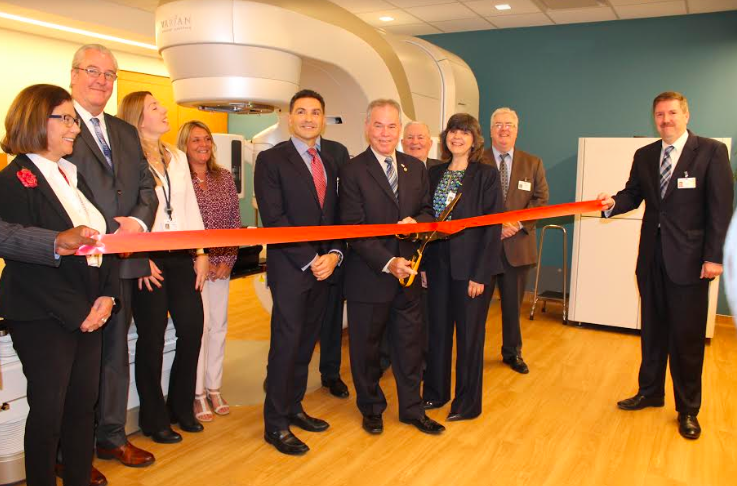 Good Samaritan Hospital will soon begin treating cancer patients using the new TrueBeam Linear Accelerator system, an innovative medical technology that enables a radically different approach to treating cancer with image-guided radiotherapy. Shawn Zimberg, M.D., Medical Director, John Rescigno, M.D., Associate Medical Director, and Raman Kaul, M.D., will begin treating patients using the hospital’s new system in July. Patients will be treated for cancers ranging from breast, prostate, head and neck, gastrointestinal, brain, lung and GYN. With dose delivery rates that are 40–140 percent higher than earlier generations of Linear Accelerator technology, the TrueBeam system can complete a treatment faster on solid adult tumors. This makes it possible to offer greater patient comfort by shortening treatment times, and to improve precision by leaving less time for tumor motion during dose delivery. “Intelligent” automation further speeds treatments with an up to fivefold reduction in the number of steps needed for image guidance and dose delivery. “TrueBeam makes it possible to deliver accurate image-guided treatments within a few minutes per day. At the same time, we can monitor and compensate for tumor motion, and that further increases treatment accuracy,” said Dr. Zimberg.